Ceiling height and floor area requirements for bedrooms in 1.5-story homes seem to befuddle everyone. I teach a lot of CE classes to real estate agents, and whenever I get to the part about ceiling height, there are a bunch of questions regarding these homes. To start, let’s go over the requirements for all rooms, then we’ll discuss the tricky ones. 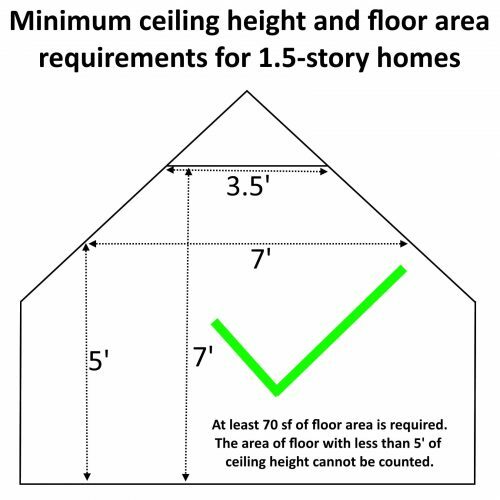 For new buildings, the minimum allowable ceiling height is 7′. According to section R305 of the Minnesota State Building Code, this applies to habitable space, hallways, bathrooms, toilet rooms, laundry rooms, and portions of basements containing these spaces. 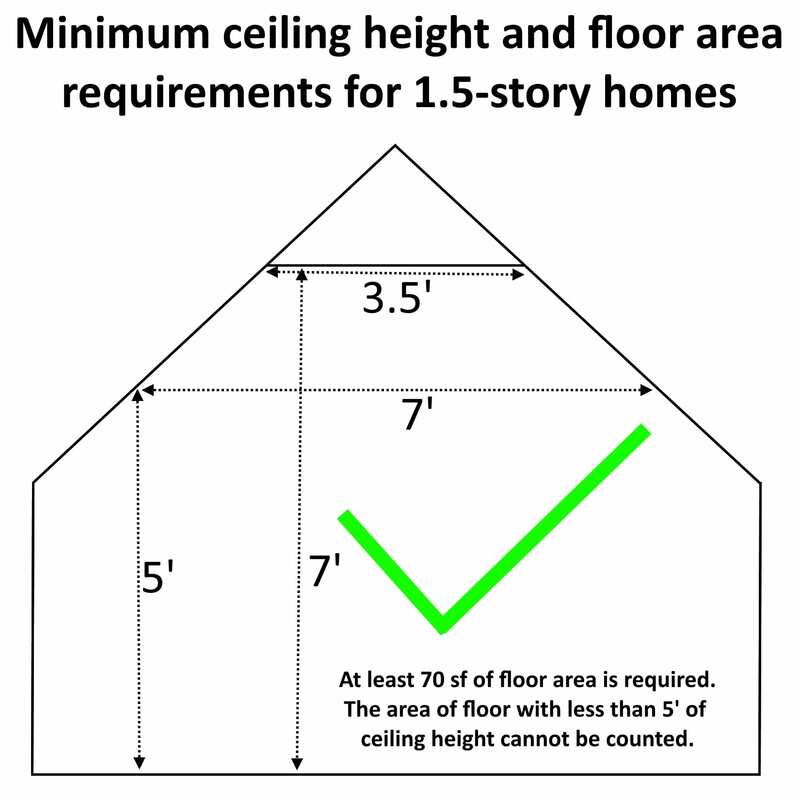 For existing buildings, the minimum allowable ceiling height for finished basement areas, including bedrooms, is 6′ – 4″. This includes beams, ducts, girders, and other obstructions, and this height must be maintained all the way to the exterior door. For anything outside of the basement, the ceiling height must still be 7′. Click the link above for all of the little details. Habitable rooms, other than kitchens, must have a floor area of not less than 70 square feet. In addition to this, rooms need to measure at least 7′ in every horizontal direction. This is found under section R304 of the Minnesota State Building Code. The building code says that for rooms with sloped ceilings, at least half of the required floor area must have a ceiling height of at least 7′. You can count the sloped ceiling area down to 5′, but nothing after that. To make it really simple, you need at least 3-1/2′ of ceiling that’s at least 7′ high. Here’s a crude drawing that’s probably not to scale, courtesy of me. The numbers in the drawing are all minimum dimensions. So what does this have to do with home inspections? Not much, really. But as a licensed Truth-In-Sale of Housing (TISH) Evaluator, I’m supposed to verify this stuff when doing TISH evaluations. Awsome ,just plain awsome someone who loves this business as much as I do . Humorous yet respectful . Thank you so much Reuben. What a great resource. Thanks for clearing up all the confusion! Reuben, l am a longtime subscriber and small real estate investor in Minneapolis. Your blog posts and videos are awesome. Please keep them coming. I will be a customer next time I need an inspection. Thank you, Marc! Much appreciated!